Did you know that June is National Fruits and Vegetables month? I didn’t, until I saw the theme for this month’s Foodie Extravaganza. But it makes sense, the farmers markets and grocery stores are full of fresh produce. And most importantly, the price of strawberries and watermelon has finally went down! Anyway, this event is being hosted by Ellen of Family Around the Table. I couldn’t decide what recipe to make for this. I debated on grilling. I debated on baking. And then I finally decided that the best way to showcase the fresh fruits and veggies was to simply make a salad. I know some people cringe when they hear the word salad, the idea of flavorless, iceburg lettuce, sad shreds of carrot, past-their-prime cucumber slices and wrinkled grape tomatoes, covered with boring dressing. To me, that’s the definition of salad in the 80’s but thankfully salads have come a long way. I mean, there’s over 10 varieties of lettuce in my grocery store now. And I feel like in the last decade or so, people have finally come past the idea that salad has to equate to diet and boring rabbit food. There are so many options for salads and so many different ingredients to include. For this event, I decided to go with a simple fruit and veggie salad. 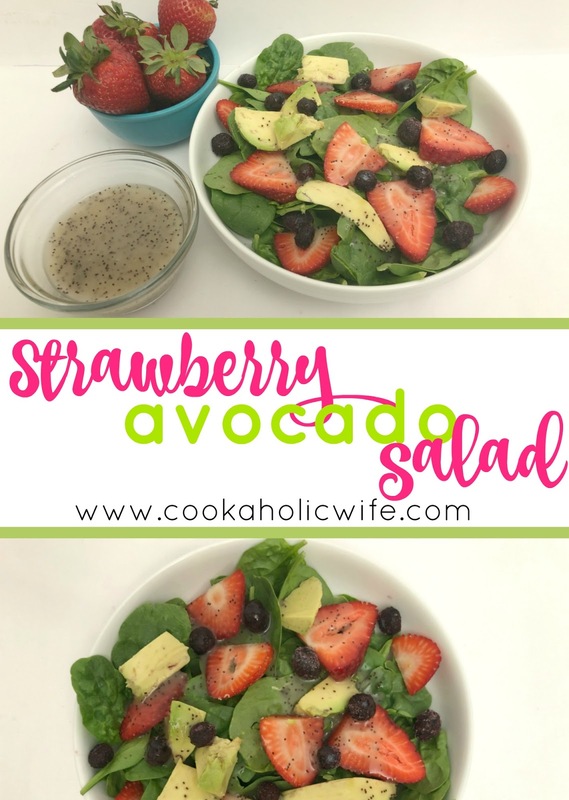 The strawberries were so sweet on their own they hardly needed the dressing and honestly, there isn’t much better than fresh slices of avocado. 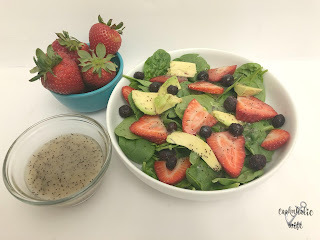 Baby spinach is dressed up when topped with fresh berries and a sweet poppyseed dressing, making a great salad for summer. 1. 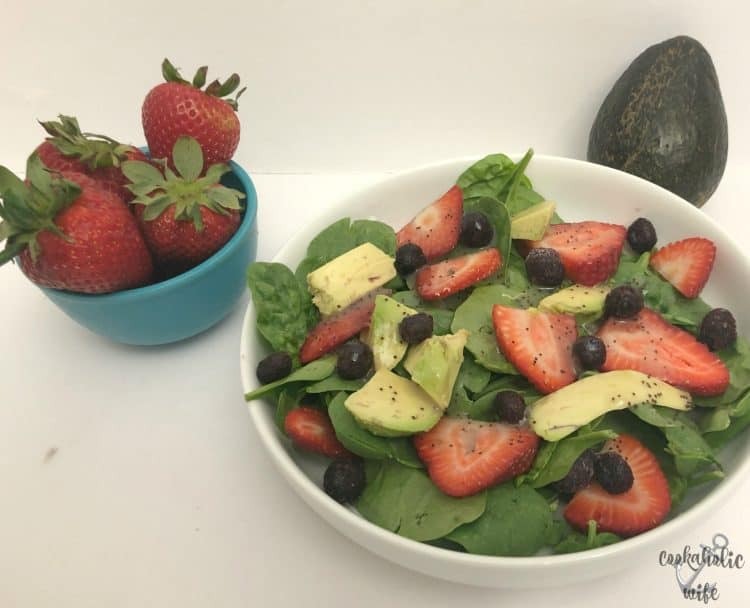 Add spinach, strawberries, blueberries and avocado to a bowl. Drizzle poppyseed dressing on top. 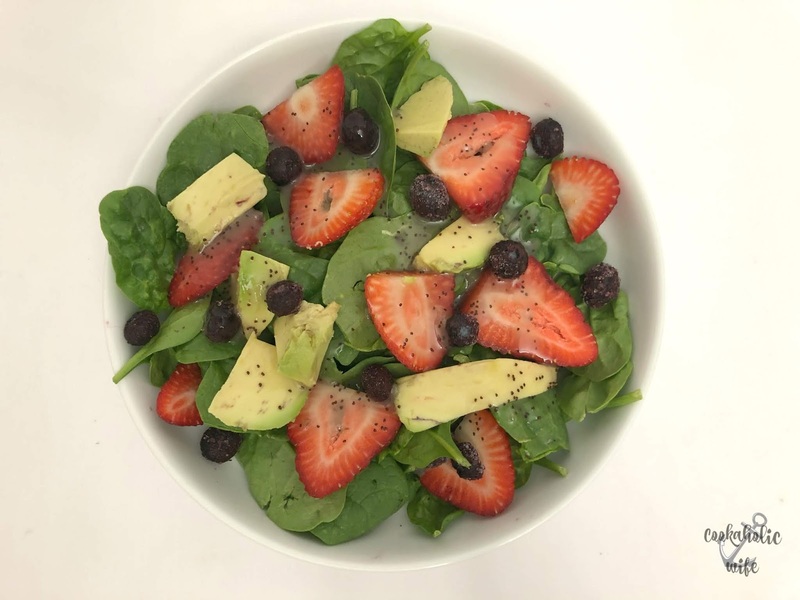 You could easily make this salad a full meal by adding a protein to it, like a grilled chicken breast, sliced steak or even prosciutto. We were having grilled chicken and potatoes for dinner, so I kept this simple as a side dish. I forgot about adding blueberries to salads and I just picked some blueberries off our bushes. 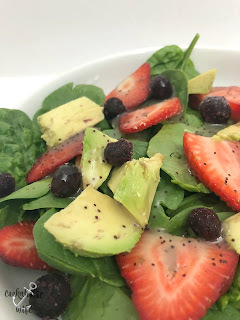 Fresh fruits in salads scream summer to me, so this is a great salad to serve to keep things light during the hot weather. This salad sounds absolutely delicious and so nutritious. Beautiful. We eat a ton of salads. This would be perfect topped with some grilled chicken breast for a summertime dinner.